The Glass-Steagall Act came up as a major point of disagreement between Bernie Sanders and Hillary Clinton during Saturday's Democratic presidential debate. The Act, which was originally enacted in 1933, separated risky trading and investment from traditional banking activities like business lending and consumer finance. 1933 -- Anthony Adverse and Magnificent Obsession were topping the bestseller lists. King Kong and the Marx Brothers were big at the box office. What does a law passed back then have to do with the 21st century economy? Bernie Sanders wants to implement a new version of the Act, which was repealed in 1999 after having been in effect for more than 75 years. Hillary Clinton, on the other hand, is not calling for its reinstatement. Sen. Sanders is right. Here are five reasons why it is important to reinstate the Glass-Steagall Act. America's largest banking institutions are even larger now than they were before the 2008 financial crisis. The nation's six largest banks issue more than two-thirds of all credit cards and more than a third of all mortgages. They control 95 percent of all derivatives and hold more than 40 percent of all US bank deposits. In the run-up to the 2008 crisis, the largest US banks had around 4 percent equity relative to their assets. This was not enough to withstand the storm ... Now, under the most generous possible calculation, the surviving megabanks have on average about 5 percent equity ... that is, they are 95 percent financed with debt. As Johnson makes clear, these banks continue to pose a grave risk to the economy. He also notes that they have continued to engage in sanctions violations and money laundering - behavior which suggests that they are still out of control. 2. The argument that Glass-Steagall didn't cause the 2008 financial crisis is wrong. Hillary Clinton told the Des Moines Register that "a lot of what caused the risk that led to the collapse came from institutions that were not big banks." This is part of a longstanding pattern, in which she largely absolves the big banks from culpability for the 2008 crisis while emphasizing "shadow banking" in her own Wall Street plan. Secretary Clinton returned to that theme during Saturday's debate, pointing an accusing finger at non-bank entities like AIG and Lehman Brothers while giving a pass to Wall Street's biggest banks for their role in the crisis. He follows that with a one-word response: "Baloney." Reich makes an important point: "Shadow banks" like AIG and Lehman, which largely function outside the normal bank regulatory system, are a major problem. But the 2008 financial crisis became a systemic threat specifically because too-big-to-fail banks were underwriting the risky bets these companies made. And why were the big banks able to do that? Because Glass-Steagall had been repealed. Given the risks associated with the repeal of Glass-Steagall, what about the benefits? Turns out there aren't many. We were told that repealing Glass-Steagall would lead to more efficiency and lower costs, but neither of these promises has come true. No less an expert than John Reed, former CEO of Citigroup, now says those claims were wrong. Reed wrote in a recent op-ed (behind a firewall) that "there are very few cost efficiencies that come from the merger of functions - indeed, there may be none at all." In fact, says Reed, it is possible that this combination of functions actually makes banking services more expensive. 4. The repeal of Glass-Steagall is further corrupting the culture of banking - if such a thing is possible. Sanders was right when he said on Saturday night that "the business model of Wall Street is fraud." The traditional practice of what Sen. Elizabeth Warren calls "boring" banking - opening savings accounts, reviewing loans, and providing other customer services - has largely been supplanted by high-risk gambling and the aggressive hustling of dubious investments to unwary clients. The level of fraud unearthed since the 2008 crisis is nothing short of breathtaking. (The fact that no senior banking executive has gone to prison for that fraud is, if anything, even more breathtaking.) How did that happen? Citigroup's Reed wrote that the repeal of Glass-Steagall led to the "very serious" problem of "mixing incompatible cultures" - which, he said, "makes the entire banking industry more fragile." He discussed the relationship-based, sociable culture of traditional banking, emphasizing its incompatibility with the risk-seeking, "short termist" mentality of investment bankers who seek "immediate rewards." Reed makes a very important point - although he's being overly kind about it. Yes, traditional bankers tend to be risk-averse and customer-focused. That's very different from the high-stakes gambling mentality of investment banking. But what Reed fails to note - or is too polite to mention - is the extent to which today's culture of investment banking is predicated on outright fraud. That's reflected in polling of the banking community itself, as well as in the industry's appalling record of documented illegality. It is this mentality, which is present in banks from the "C" suite on down, which has given rise to Wall Street's tsunami of misdeeds. This greed-driven fraud mentality is like a virus, consuming too-big-to-fail banks even as they exert ever-greater control over our economy - and our political system. These megabanks aren't just a "systemic threat" to our economy. Through their enormous wealth, and because of the ruthlessness with which they're willing to wield their influence, they are also a systemic threat to democracy itself. That threat can be seen in the workings of last year's Congress, which saw the successful insertion of a lobbyist-drafted "Citigroup amendment" into a last-minute budget bill. It can be seen in a political climate where the Republican head of a Congressional Committee can say that "Washington and the regulators are here to serve the banks." 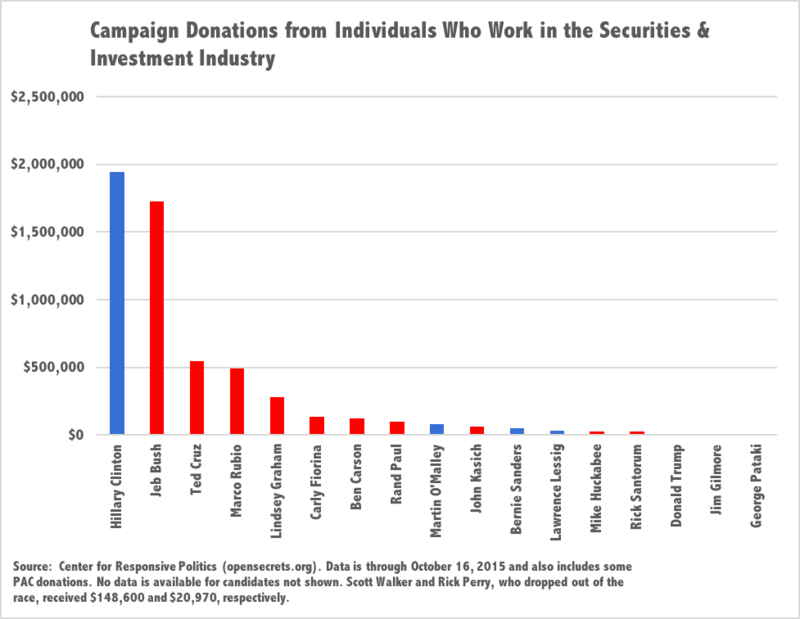 It can be seen in Wall Street political contributions which flow to powerful and familiar names, Republican or Democratic. Banks have acquired too much power. They must be broken up vertically (by line of business) and horizontally (by size), even as their corrupting influence over our government is ended through a system of fundamental election reform. In today's environment, reinstating Glass-Steagall is not just the right policy - although it is certainly that. It's also an excellent litmus test for politicians who say they're willing to take on Wall Street. Sign up here to get alerted when RJ posts a new segment on money and politics.